Description: Illinois Taxing District Map for Tax Year 2010. Geospatial data representing taxing district boundary information collected from Illinois county clerks. Map identifies the boundaries of property tax districts to be used for general illustration and research. 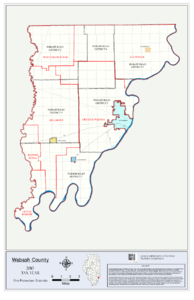 Description: Illinois Taxing District Map for Tax Year 2012. Geospatial data representing taxing district boundary information collected from Illinois county clerks. Map identifies the boundaries of property tax districts to be used for general illustration and research. Description: Illinois Taxing District Map for Tax Year 2013. Geospatial data representing taxing district boundary information collected from Illinois county clerks. Map identifies the boundaries of property tax districts to be used for general illustration and research. Description: Press release: Wabash County has been issued a final property assessment equalization factor of 1.0000, according to Brian Hamer, Director of the Illinois Department of Revenue.